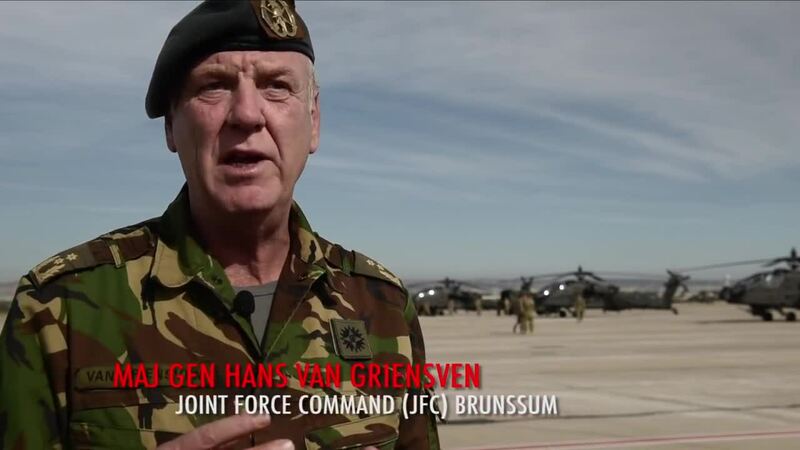 Maj Gen Hans Van Griensven, Joint Force Command (JFC) Brunssum: "The importance of the air, as it is with the maritime and land. You have to stick together and fight together to have the maximum effect and be responsive to whatever crisis." "The big advantage of air is that it's very fast. we use it for everything, for transport of personnel and material, we use it for delivery of weapons systems, we use it for med evac for example - to get wounded people out of the theatre." 1st Lieutenant Christopher Nelson, Apache Pilot, US army: "Our role in this whole operation is to manage the flow of what goes on in the airspace ensuring we providing security for ground troops to get where they need to go, and providing security for once they get there when they're on the battlefield, and that's the integration from air to the ground. Ground forces are also going to be integrating with many of our NATO adjacent aircraft and it's absolutely critical we're not just familiar with our own air frames but the air frames of our adjacent nations." Lt Col Wim Shoepen, Detachment Commander, 17th Squadron: "The aircraft present are from Belgium four helicopters, the Czech Republic four helicopter and six fixed wing, from the Ukraine one Ilyushin-76, and of course the Americans with their Chinooks, Blackhawks and Apache helicopters. the fact that we even have some non-NATO people present here like the Ukrainian transport aircraft means that actually this is an exercise that goes beyond NATO, also with the Partnership for Peace."